You can use a search feature to find contacts in the Contacts app on your iPad, using a person’s first or last name or a company name. This one is pretty much like every search feature you’ve ever used, though it’s a simple feature compared to some, since you can only search for names and there are no advanced search techniques available. 1With Contacts open, tap in the Search field at the top of the left-hand page. 2Type the first letter of either the first or last name. Search results narrow down as you type. 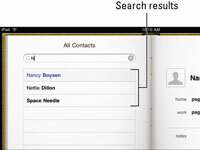 3Tap a contact in the results to display their information on the right page. You can also use the alphabetical listing to locate a contact. 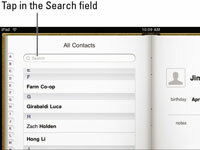 Tap and drag to scroll down the list of contacts on the All Contacts page on the left. You can also tap any of the tabbed letters along the left side of the page to quickly scroll to the entries that start with that letter.